Man's search for meaning is the primary motivation in his life. There is a longing deep within every man's heart to discover meaning and purpose in life; to lead a life of significance as opposed to a life of success; to live a life of adventure, conquest, and victory; to make a difference and leave a positive, enduring mark on the world. Yet, as Henry David Thoreau observed, The mass of men lead lives of quiet desperation. Although Thoreau penned these words more than a century ago, they still ring true today. So many men-including devoted Christian men-wake up one day and realize they are leading lives of quiet desperation, silently losing themselves as they strive to meet unrealistic expectations, overcome mounting work and family pressures, and battle unrelenting temptations. These challenges can easily sidetrack men, causing them to lose their spiritual focus. Yet there is a remedy to this cultural epidemic, and it is found in reclaiming and living out every man's true purpose, which is found in God alone. As Saint Augustine wrote, Thou hast made us for Thyself, O Lord, and our hearts are restless until they rest in Thee. The apostle Paul expressed it this way: Everything, absolutely everything, above and below, visible and invisible . . . everything got started in [Christ] and finds its purpose in him (Colossians 1:16 The Message). As you make your way through the year (whether you start in January or June), you will be undergirded by a sense of brotherhood-an assurance that you are not alone on this journey. With this confidence, may you boldly and courageously pursue a full and abundant life in Christ! 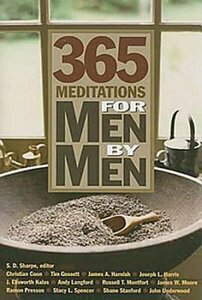 About "365 Meditations For Men By Men"